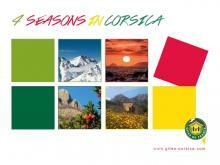 Our gites and holiday apartments in Corsica are many and varied! But whether in the country, by the sea or in the mountains, the rural gite is an independent house or unit of accommodation, which offers one or more bedrooms, a lounge/dining room, a kitchenette or kitchen, and bathroom facilities. Some of our rural gites and holiday apartments in Corsica can be rented for weekends, but the majority are rented for one or more weeks, particularly during the school holidays. Gites Corsica is governed by a national charter and all our gites and holiday apartments in Corsica have been carefully selected and are regularly checked to ensure they meet all our requirements for both hospitality and quality of accommodation. The owners may or may not live nearby, but when you arrive at your chosen accommodation in Corsica, they will be on hand to welcome you. Our standards of comfort are precisely defined, with each of our gites and holiday apartments in Corsica being given a rating from 1 to 5 “épis” (ears of corn).